No product purchase or entry fee is required. 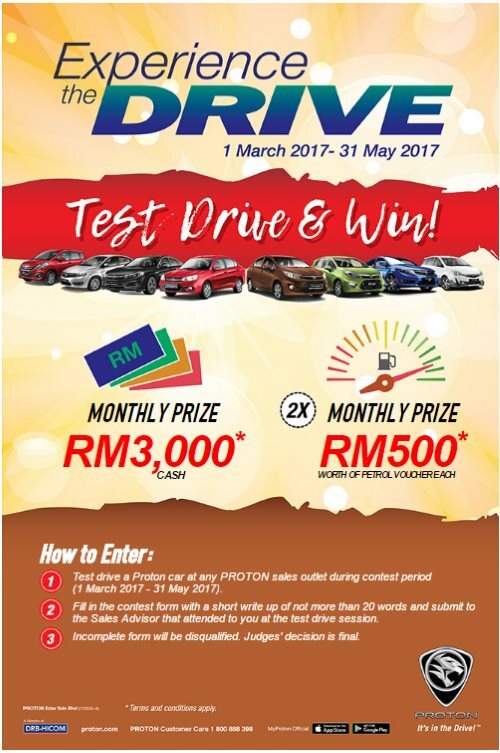 Participants shall go to any PROTON showrooms and/or PROTON roadshow locations to test drive a PROTON car in the presence of a PROTON’s Sales Advisor and fill up the Contest form with a caption/description in Bahasa Malaysia or English of not more than 20 words. The caption/description should start with, “I enjoy driving the Proton car because…”. The Contest form submitted must be complete, failing which the entry will be automatically disqualified. Test drive can be booked via MyProton mobile apps, direct walk-in to respective PROTON showrooms and/or PROTON roadshow locations. For the avoidance of doubt, road show locations refer to selected places and/or location where PROTON has their on ground activities. The MyProton mobile app is available on both Google Play Store and Apple App Store. Participants can submit more than one entry provided that each entry submitted is of a different model. Visit PROTON Experience the DRIVE Contest page for more details.